The EA Gideon is an Expert Advisor that trades ON NEWS and ON EVENTS that have a strong influence on the market, but do not occur regularly! That is the EA opens Sell Stop and Buy Stop pending orders in case of a sudden price change in any direction and closes them automatically with the profit that you wish. And we all know how often the price changes when a "successful" news appears, how far it can go up or down. Also, this robot protects your deposit by placing SL with customizable parameters. Three strategies are built into the EA: 1) maximum, 2) normal, 3) minimum. Each strategy can be configured individually. Use of this EA eliminates the necessity to stay near your PC during news releases. Placing orders, opening, maintenance, closing or deleting orders — EA Gideon will do it for you. This is not an autonomous expert, t is a complement to your experts. The EA is optimized for the EURUSD M30. But you can configure it for any currency and timeframe. It is recommended to choose ECN brokers and accounts with minimum spread. EA Comment — order comment. 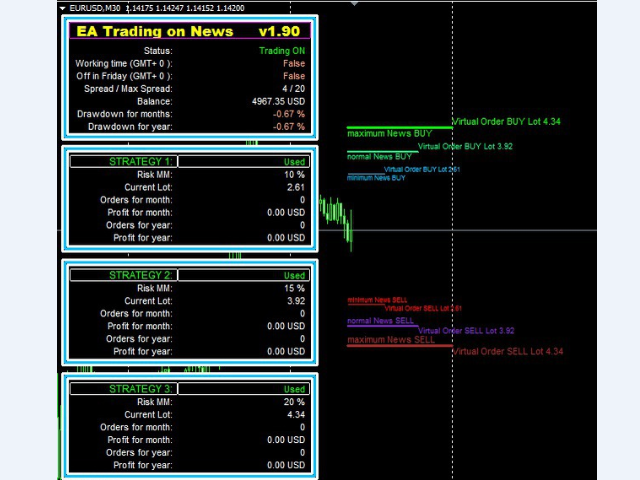 Order Type — Selection of the trade direction. visibility_Order_Stop_correction_coefficient — The coefficient of the distance from the current price to the virtual order. Delete_Order_Stop_correction_coefficient — The coefficient for deleting the pending order. Use news strategy N1 — If true, the first strategy is used. Use news strategy N2 — If true, the second strategy is used. Use news strategy N3 — If true, the third strategy is used. Use Risk MM — If this is true, the lot size will increase when account balance grows (Risk Management). Percentage Risk — Lot size increase based on the balance value (Risk Management in %). Step_Orders — The step of the distance from the virtual order to the current price. Step_Factor — Factor, if the price moves away from the virtual order. Step_Factor_revers — Reverse, if the price moves towards the virtual order. Take Profit — Take Profit in points. Stop Loss — stop loss in points. Use_Break_Even — If this is true Stop loss price will be moved to breakeven when price is above target points. Breakeven Target PipsInp — If the price exceeds the value, breakeven triggers. Breakeven Jump PipsInp — stop loss is moved to breakeven using this value. 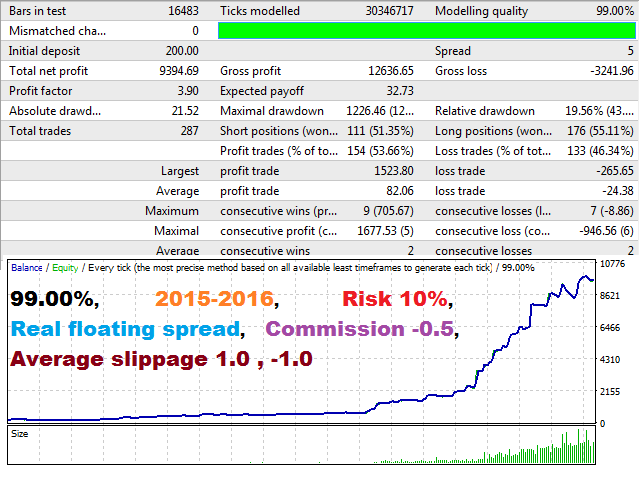 Trailing Stop — Trailing points when the position is in profit. Trailing Step — Trailing step when the position is in profit. Great seller and interesting EA, looks good on backtest now needs forward testing. Added protection against high spread: if the average spread is greater than the (max spread) variable, the EA closes pending orders and does not place new orders.